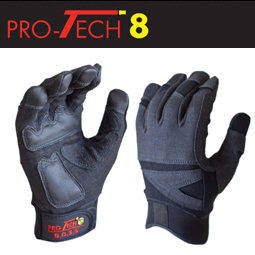 Pro-Tech 8 speciality structural firefighting and rescue gloves have been designed for high safety protection and hand dexterity. The Pro-Tech BOSS glove is the all round lightweight utility, extrication and rope glove that is available in Hi-Vis yellow and General use Black. This gloves offers the best offensive protection for technical rescue, clean up and many utility applications. The Pro-Tech 8 range of gloves includes the Fusion, Titan and Titan K structural firefighting gloves along with the B.O.S.S. , ICE and Pro-Tech 8 X extrication, rope and rescue gloves. "Techtrade focus on the people wearing the gloves, they listen to their feedback and develop products that fire and rescue workers want to wear. Partnering with Techtrade was an easy decision given the synergies between the companies," said Mr Elliott. The Pro-Tech 8 range of structural firegloves are independently tested and certified by SEI (Safety Equipment Institute) to NFPA 1971 standards. Pro-Tech 8 gloves are fast becoming the first choice of firefighters and rescue teams looking for high levels of protection and dexterity. To learn more about the Pro-Tech 8 range visit the Elliotts online at elliottaustralia.com. Elliotts quality Personal Protective Clothing (PPC) and Personal Protective Equipment (PPE) are proven on-the-job every day. They are specified routinely for and by workers in metal, petrochemical, mining, emergency services, construction and other industries where hazards exist. These reliable and popular products are part of a comprehensive range evolved over time and based on the common foundation of quality and care for which the company has built its reputation.Elliotts quality safety gear allows you to take care in any situation.